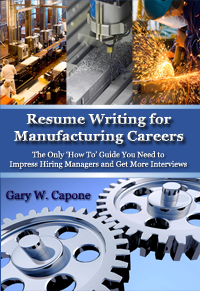 Resume Writing for Manufacturing Careers is a new book by Gary W. Capone, providing detailed resume writing instructions tailored to the needs of manufacturing professionals. The book is now available on Amazon and through other retailers. In a very competitive manufacturing job market, this book is the tool you need to write a more effective resume that gets results. It is customized to the needs of manufacturing professionals, with detailed examples, all tailored to manufacturing careers. The examples illustrate common mistakes and the ways to correct them. The book shows a systematic process for writing and improving a resume. The book then illustrates this process in a comprehensive, step-by-step example, showing the resume writing process of a hypothetic manufacturing professional. Every aspect of the resume writing effort is shown in detail, starting from scratch and ending with a resume designed to get results. Two incredibly powerful tools vital to your success are included with the book. The Resume Assessment shows you how to assess your finished resume. Each of the 30 assessment steps includes a short best practice explanation. The Work Experience Worksheet is a tool to help you collect the data you need to write your resume and find the career features that give you an edge over your competition. With these tools, the detailed examples and the techniques taught in the book, you will gain the knowledge you need to develop a resume to impress hiring managers and get more interviews.